Will Washington Betray Anti-Regime Iranians? As the United Nations mandate that legitimizes the presence of U.S forces in Iraq expires on December 31, 2008, a humanitarian and strategic disaster is coming into view. The fate of about 3,500 anti-regime Iranians will be decided in the course of status-of-forces negotiations between Washington and Baghdad. 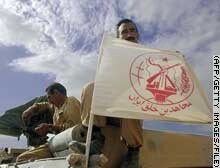 MEK members display their flag as they pass through a U.S. checkpoint in Iraq in 2003 (AFP). They are members of the Mujahedeen-e Khalq (MEK; it is also called the People's Mojahedin of Iran, or PMOI), the leading Iranian opposition group. Based at Camp Ashraf in central Iraq where they are recognized as "protected persons" under the Fourth Geneva Convention, they have since 2004 been under the protection of U.S. military forces. According to the Convention Against Torture of 1984, to which the U.S. government is a party, expiration of the UN mandate does not end the American obligation to continue to protect MEK members in Iraq. Further, the MEK's network of supporters inside Iran have provided invaluable intelligence. For example, it exposed Tehran's nuclear ambitions and its shipments of roadside bombs to Iraq. Recognizing this assistance, a "Memorandum for the Record" by Lt. Col. Julie S. Norman dated August 24, 2006, noted that "The PMOI has always warned against the Iranian regime's meddling and played a positive role in exposing the threats and dangers of such interventions; their intelligence has been very helpful in this regard and in some circumstances has helped save the lives of [U.S.] soldiers." Although the State Department still lists the MEK as a Foreign Terrorist Organization (FTO), that will likely end in October, for it no longer meets the terrorism criteria, having renounced terrorism, not conducted operations for many years, lacking the capability to conduct future operations, and not threatening the security of the United States. Gen. Raymond Odierno, soon to be the top U.S. military commander in Iraq, already in May 2003 questioned the MEK's designation as an FTO: "I would say that any organization that has given up their equipment to the coalition clearly is cooperating with us, and I believe that that should lead to a review of whether they are still a terrorist organization or not." Since then, an interagency group of the U.S. government, led by the FBI, has exonerated the Iranians at Ashraf of terrorism. After a British court ruled that the group was not "concerned in terrorism," the U.K. government in June removed the group from its terrorist list. Naturally, the expulsion of the MEK from Iraq ranks as Tehran's top demand of both Baghdad and Washington. The Iranian regime is determined to destroy its main opponent and, with some success, has pressured the Iraqi government to disband Camp Ashraf and turn MEK members over to Iran. Iraqi politicians sympathetic to Tehran have joined in this call, including leaders of the United Iraqi Alliance and the Supreme Islamic Iraqi Council. Then, on July 9, Foreign Minister Hoshyar Zebari said that the Iraqi government had decided to expel members of the MEK. The Iranian ambassador to Iraq, Hassan Kezemi-Qomi, specified that the Iraqi cabinet had agreed quickly to expel the MEK from Iraq. Iran's Jame Jam television channel reported on July 6 that "American military forces have announced their readiness to hand over" Camp Ashraf to Baghdad, which gave the MEK six months to leave its territory. Should these reports be true (and it bears noting that prior such statements had little operational effect), they imply either the handover of unarmed Ashraf residents to Iraqi forces or their expulsion to Iran. In either case, a full-scale slaughter, whether by Tehran's proxies in Iraq or by Tehran itself, appears likely. Inspired by such a success, Tehran's ambitions in Iraq would undoubtedly grow further. The Bush administration has stayed silent about these developments but it has the duty and the interest – based on its humanitarian commitments, its international law obligations, and its need for allies against Tehran – to insist in its status-of-forces negotiations with Baghdad that MEK members at Camp Ashraf remain under the protection of the U.S. military and that they be free to leave Camp Ashraf. After delisting the Mujahedeen-e Khalq as an FTO, Washington should use the regime in Tehran's near-pathological fears by threatening to meet with it and help its public relations efforts. This is the easiest, most effective way to intimidate the Islamic Republic of Iran. Related Topics: Iran, US policy | Daniel Pipes receive the latest by email: subscribe to the free mef mailing list This text may be reposted or forwarded so long as it is presented as an integral whole with complete and accurate information provided about its author, date, place of publication, and original URL.